I was walking around in a very chichi (translation: expensive) shop and saw the cutest note pads. They were, however, so far out of my price range that it wasn’t even funny. Plus, I didn’t like the sayings on them. A stop by Wal-Mart and Hancocks on the way home, and I have 5 of my very own bow pads for less than $10. 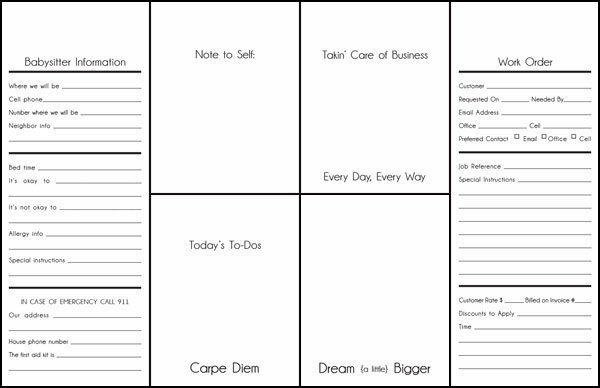 I made two different sizes – tall skinny note pads for forms and smaller rectangular shape for the others. I made up a couple of different printables that you can use to make your note pads. They are free and available to download and print just below! 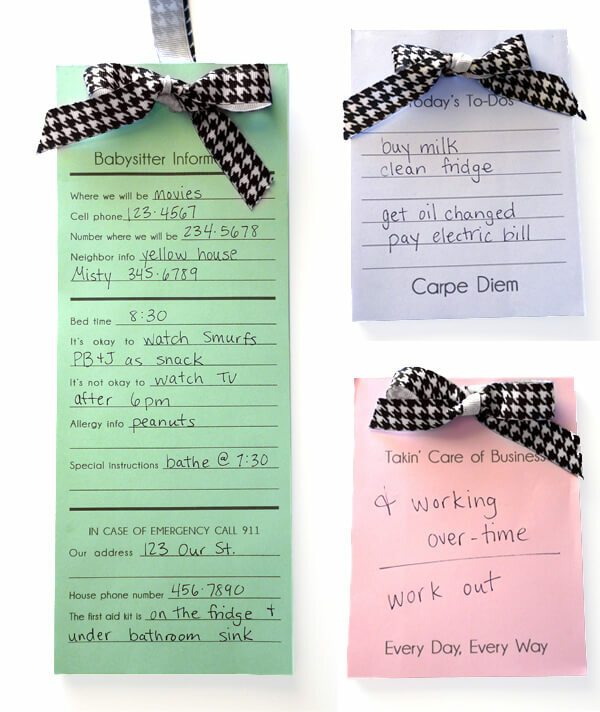 Except for the Babysitter Info and Order Form – each notepad has two options – with or without lines. Be sure to print only the page you want! Click on the note pad that you want below, and it will take you to the printable PDF! 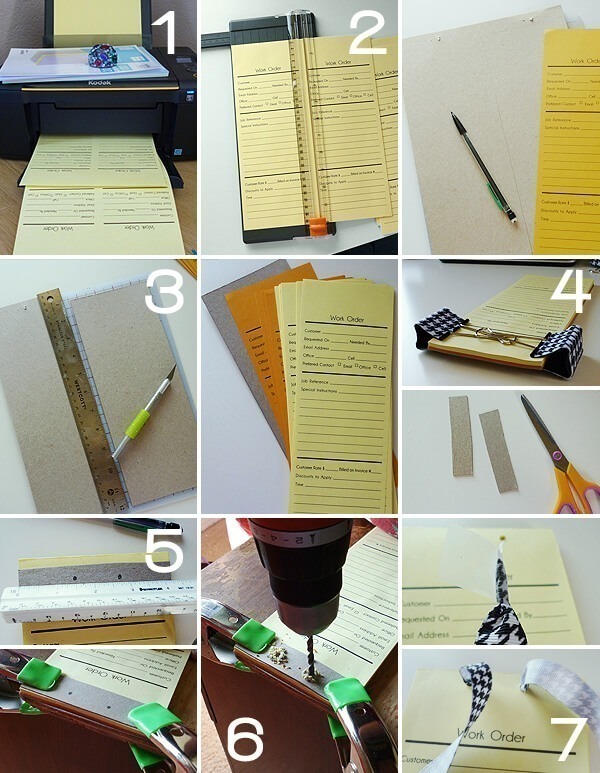 Paper in the color of your choice, paper cutter, large binder clips, rubber cement, power drill and bit, junk wood, hardware clips, x-acto knife and cutting pad or scissors, stiff backing (thin cardboard, poster board, etc. ), ribbon. STEP 1: Choose the notepad you would like to create and print out on your selected paper. STEP 2: Cut your paper to divide. For the “work order” and “babysitter information” you’ll have one cut down the middle at 4.25 inches for your two pages per sheet. For the others you will have a cut at 4.25 inches and another at 5.5 inches to get your 4 pages per sheet. STEP 3: This is the time to cut out the backing for your notepad. I had a couple of backs left from yellow letter paged notebooks that I used. A couple other options could be poster board, gift boxes, cardstock or any other sheet that is heavier than the paper you are using. Trace out the shape of a single sheet of your notepad. Carefully cut out. STEP 4: Neatly stack your cut papers on top of your backing. Use your binder clips to keep the papers close together. You’ll want the clips very close to the top to keep the papers together well. Go over the top with a generous amount of rubber cement 2 or 3 times. 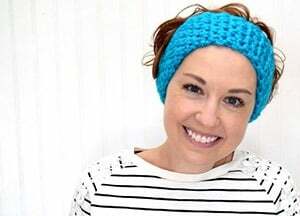 Leave clipped until completely dry (test by putting a piece of paper on the glue – if it does not stick you can proceed). STEP 5: Cut out some strips of your backing that are approximately 4.25 inches. Draw two circles approximately 1.25 inches in on both sides as guides. Layer your piece of junk wood, one backing strip, your notepad and the top strip with drill marks and using your hardware clips to keep them all together. You can drill straight through the paper if you prefer, but your front and back not will be cut as cleanly. STEP 6: Taking care to keep the drill straight, drill on the holes that you have pre-marked. Keep the speed of the drill slow, but steady. There will be a small amount of smoke, but don’t panic ! :) When a little bit of wood grounds will start to show up, you have gone all the way through the pad. Unclip from the board and remove the backing pieces. STEP 7: Take your piece of ribbon and wrap one end with tape – just like you do on shoelaces when you lose the nib. Shove through one hole, wrap through the back and up the other hole. Tie your bow and finagle until you are happy with it. If you would like to hang your notepad, keep a length out of around four inches at the back and knot just prior to tying your bow. That’s it for today. Hope your Monday is a fun day!!! So cute! I love this! Couldn't help but giggle at the babysitter notes saying PB&J is a good snack, but there are peanut allergies! I've always been told I don't fib well… It probably took me 15 minutes to fill that silly example out, too! :) Thanks for visiting! I'm not seeing where to download this and I would really love to! Is there a link I'm missing? Thanks! Hi Christen! Thanks for the heads up. My link died! If you look at the image of the black and white note pads all together, you can click on the note pad that you want to go to and it will open up the PDF in a new window. So sorry for the hassle!